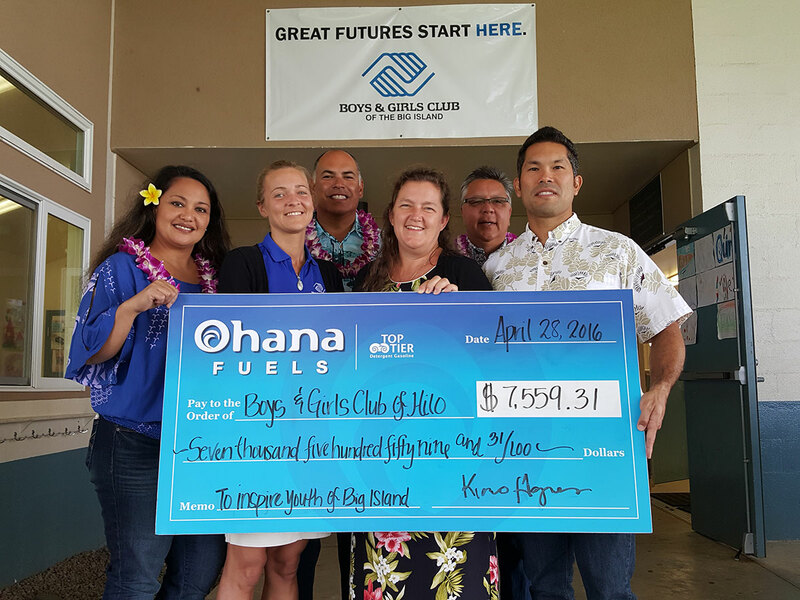 Boys & Girls Club of the Big Island receives $7,559.31 donation from Ohana Fuels. (Hilo, HI) – Boys & Girls Club of the Big Island (BGCBI) was the most recent beneficiary of the Ohana Fuels “Fuel up. Do good.” Community Giving Program. Ohana Fuels partners with nonprofit organizations that serve the needs of the local community, and donates a portion of every gallon of gasoline purchased at all Ohana Fuels stations in that community. The total donation to BGCBI was $7,559.31 from gasoline sales during the 1st quarter at all Ohana Fuels locations and proceeds from carwashes held during the quarter. BGCBI receives donation from Ohana Fuels. L-R Joy Madriaga (HFN & Commercial Marketing Representative), Jamie Wenzlow (BGCBI Hilo Club Director), Kimo Haynes (Hawaii Petroleum President), Zavi Brees-Saunders (BGCBI out-going Chief Executive Officer), Lloyd Leong (HFN VP of Business Development and Sales), Chad Cabral (BGCBI incoming Chief Executive Officer). Ohana Fuels is Hawaii Petroleum’s retail fuel brand that provides competitively priced, quality fuels at safe, clean, and convenient locations including eight stations on the island of Maui, and nine stations on the island of Hawaii. Certified as a TOP TIER™ fuel provider, Ohana Fuels meets the premier standard of gasoline for optimum performance and fuel efficiency. Hawaii Petroleum is committed to making a positive contribution to the communities in which our Ohana Fuels stations operate, and gives local residents a way to support the community with every tank of gas they purchase. The Pacific Cancer Foundation benefits from Ohana Fuels $7,418 donation.